Charlie Dixon joined Queensland football’s 100 AFL Goal Club last weekend. 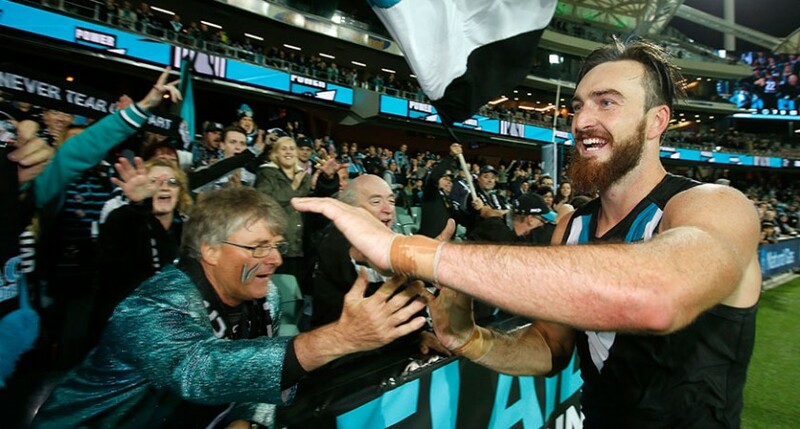 Playing his third game for Port Adelaide against Essendon at Adelaide Oval Friday night, the powerhouse key forward kicked three goals for a career total of an even ton after he kicked 94 goals in 65 games for the Gold Coast Suns. He is the 14th Queenslander to reach 100 AFL goals and joins a list is headed by the incomparable Jason Dunstall, who kicked 1254 goals and sits third on the all-time AFL list behind Tony Lockett (1360) and Gordon Coventry (1299). Behind Dunstall is Nick Riewoldt (654), Jason Akermanis (421), Kurt Tippett (307), Michael Voss (245), David Hale (217), Che Cockatoo-Collins (215), Mitch Hahn (164), Marcus Ashcroft (145), Dayne Beams (128), Brad Miller (120), Jesse White (120) and Michael Osborne (109). Dixon was the leading goal-kicker among 21 Queenslanders to play in Round 3 of the Toyota AFL premiership after Josh Wager, a standout with Aspley in the NEAFL last year, made his debut for Melbourne against North Melbourne in Hobart. Wagner played 63% game time and had eight possessions, four tackles and three 1%ers as the Demons came within a whisker of upsetting the unbeaten Roos after conceding the first seven goals of the match. Gold Coast swingman Clay Cameron had a career-best 18 possessions and played arguably his best AFL game as the Suns made it three wins from three games against Carlton at Metricon Stadium. He also kicked the third goal of his career. Sam Gilbert, playing his 160th game for St.Kilda, kicked an equal career-best two goals in the Saints’ win over Collingwood. It was the fifth time the long-time defender has kicked a double. Adam Oxley also impressed for the Pies in the same game, collecting 25 possessions to rank equal highest among Queenslanders in Round 3. Brisbane’s Dayne Zorko also had 25 touches against Geelong on Sunday. Kurt Tippett had an equal career-high 32 ruck hit-outs for the Sydney Swans as they beat cross-town rivals GWS in the Battle of the Bridge. It was the second time in three games this year Tippett has matched the figure he posted in Round 19 last year. In the opening round of the VFL, Jesse White enhanced his claims to a senior recall at Collingwood when named his side’s best playing in defence against Port Melbourne. Josh Smith kicked two goals and had 24 possessions in the same game for the Pies. Brendan Whitecross kept his name forefront among the minds of Hawthorn selectors with a standout performance for Box Hill against Sandringham. He had 24 possessions, kicked a goal and was named his side’s second best player. Corey Wagner, younger brother of Josh, was named fourth best for Werribee, a North Melbourne affiliate, against Essendon. Sam Michael kicked one goal for the Bombers. In the Lions Reserves, Queensland youngsters Eric Hipwood (22poss), Ben Keays (31) and Matt Hammelmann (3 goals) were rated their best three players in a 67-point loss to Redland. Queenslander Aliir Aliir, playing at centre half back, was named second best for the Sydney Swans Reserves in their 18-point win over the GWS Giants Reserves with 17 possessions.